The era of the "New Brain" is upon us Already our brains are working differently than they did just one hundred years ago. Drugs are already available that work in the brain to prevent us from feeling drowsy, depressed, anxious, or fearful, or that enhance concentration and memory. Dramatic treatments to repair damage in the brain are becoming common. In The New Brain, neurologist, neuropsychiatrist, and bestselling author Dr. Richard Restak tells how technology and biology are converging to influence the evolution of the human brain. 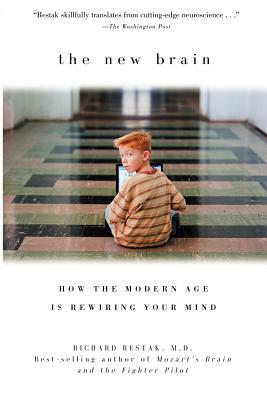 Dr. Restak describes the dramatic advances that now are possible, as well as the potential for misuse and abuse, examining such questions as: Is Attention Deficit Disorder a "normal" response to the modern world's demand that we attend to several things at once? What happens in our brains when images replace language as the primary means of communication? How does exposure to violent imagery affect our brains? Are we all capable of training our brains to perform at a superior level?